Turns out you can make biofuel from just about any oily plant product. Corn may be the standard, but coffee works at least as well, and it makes your car smell like a Starbucks! Experts say it takes about 5-7 kg of coffee grounds to get one liter of biofuel, which with a medium-sized production would yield a cost of about $1 per gallon. Plus, it's already used: you can just walk around to your local coffeeshops and convenience stores and stock up the same way you would on vegetable oil. Creating fuel from the grounds uses the same procedure as other biodiesels, transesterification, which is sort of complicated to explain but fairly inexpensive. 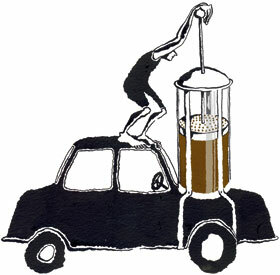 The US estimates we consume over 7 tons of coffee each year, which would yield about 340 million gallons of biodiesel. But mostly, a subtle coffee scent might overcome the significantly less savory odors currently dominating my car. For long story click here. We'd love to hear from you. What do you think of this idea?? In"Economist", "biodiesel", "brewed coffee", "coffee grounds", "oil", "vienna coffee company"